A View of Christmas Harbour in Kerguelen's Island, engraved by Newton after John Webber, 1784, Davidson Galleries. Thanks once more to Adam Hodges-LeClaire for pointing this out to me! 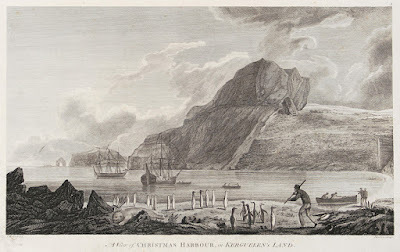 I immidiately dispatched Mr [William] Bligh the Master in a boat to Sound the Harbour, who on his return reported it to be safe and commodious with good anchorage in every part, and great plenty of fresh water, Seals, Penguins and other birds on the shore but not a stick of Wood. Webber's original drawing, in the collection of the British Library, shows a slightly different scene. 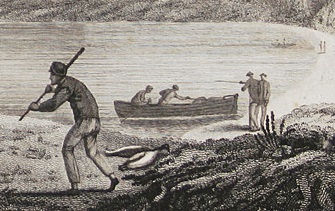 The penguins are still milling about, but there is no club bearing sailor come to hunt them. Two are already dead by his feet. It is unclear why the sailor was later added, and who put him in there. Perhaps he was drawn to add some action to an otherwise rather static scene. There is another version, colorized, in the collection of the State Library of New South Wales, that includes the club carrying sailor. Our tar wears a cap or round hat with very short brim. His jacket (blue in the State Library of NSW version) runs to the natural waist, and his plain white trousers with side seam pockets end at about the bottom of the calf, revealing his white stockings.